Learn where to eat vegetarian and vegan-friendly ramen at five Tokyo shops in Harajuku, Shinjuku, Ueno, and other popular areas. These easy-to-get-to restaurants are ideal for solo travel or with friends, with delicious menus that will please all. Ramen is, without a doubt, one of the most popular and well-loved dishes in Japanese cuisine. With hundreds of restaurants, Tokyo is one of the best places to find excellent ramen in Japan. A typical bowl contains animal and fish-derived ingredients, so diners with dietary restrictions and allergies often find it challenging to get noodles that they can eat. As awareness of veganism and vegetarianism grows in Japan, some restaurants and shops are changing the conventions of ramen. 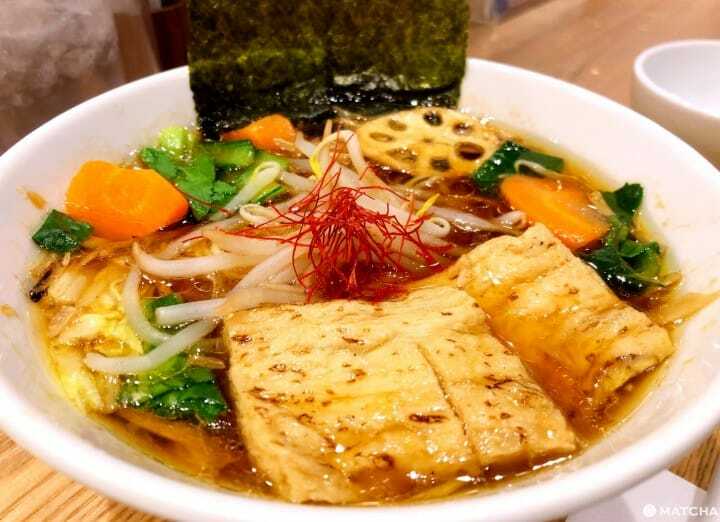 This article introduces five vegan and vegetarian-friendly ramen restaurants in Tokyo in Shinjuku, Harajuku, Ueno, and areas close to public transportation, sightseeing, and shopping. Each of these restaurants has an English menu and staff that can communicate with international guests. Soranoiro is a ramen chain with multiple stores throughout the Tokyo and a restaurant in Nagoya. Soranoiro is renowned for its ramen in Japan and was even featured in the 2015 edition of the Michelin Guide. Two locations, Soranoiro in Kojimachi, and Soranoiro NIPPON in Tokyo Station on Ramen Street, have animal and fish-product free ramen options that are satisfying in flavor and portion. The most popular vegan and vegetarian-friendly selection is the vegesoba (1,000 yen; pictured above), a dish with a flavorful broth full of seasonal vegetables. The standard noodles contain bell pepper, resulting in their vivid color and a unique taste. You can change to brown rice noodles, which have a different, more defined rice-like flavor. Each bowl at Soranoiro comes with a smear of yuzu (Japanese citrus) and chili sauce that you can mix to your liking while you eat your ramen. Try Vegan Veggie Ramen At Soranoiro In Kojimachi! Noodle Stand Tokyo is a restaurant within walking distance of Takeshita Street, Meiji Shrine, and other popular sightseeing spots in the Harajuku area. It is a convenient stop to make when you get hungry exploring western Tokyo. The menu here focuses on local, ethically-derived ingredients, which is shown with the great taste and high-quality of each bowl of ramen. The vegan-friendly ramen here is the Coconut Miso Ramen (1,100 yen including tax). Topped with ginger, greens, and soy meat char siu, the broth has a creamy flavor from the coconut adds to the toppings and thick noodles. The high-quality noodles in the vegan option are low carb, making it a good option for health-conscious diners. Another vegan option is the Dandan Noodles (900 yen including tax) which can be enjoyed once a week on the special Friday menu. These noodles are Taiwanese-style and have a thick broth, made with sesame paste and chili oil. This version uses traditional ingredients, soy meat, and greens, to create a slightly spicy dish. Like the coconut miso ramen, this is another filling, delicious choice. Menya Musashi is a ramen chain in Tokyo, considered to be a ramen pioneers during the rise of ramen's popularity in the 80s and 90s. Named after the famous samurai Miyamoto Musashi (1584 - 1645), this highly-acclaimed ramen is known most for its fish and animal-based bowls. There are restaurants throughout Tokyo, but the main branch in Shinjuku offers a seasonal vegetarian and vegan option that allows more diners to sample the renowned taste. The Miso Vegan Ramen (1,080 yen including tax) contains soy meat, wheat gluten, bamboo shoots, and other vegetable toppings. The vegan ramen is made specifically to satisfy non-vegan and vegetarian customers, making it a good option for all diners. At Menya Musashi, the type of vegan ramen available changes throughout the year, but the voluminous portion and flavor of this vegan ramen are sure to satisfy hungry customers any time of year. Menya Musashi emphasizes the entire dining experience and shows this with the inviting, charming Showa-style interior of the restaurant. This is an ideal stop to make when visiting Shinjuku, as it is close to JR Shinjuku Station and major sightseeing, like Shinjuku Gyoen. AFURI is a chain of ramen restaurants with international locations that started in Tokyo, famous for making light, nutritious ramen with rare flavors. They are well known especially for their use of yuzu, which adds a citrus flavor to the soup. The flavor of the ramen here is unique and worth trying at least once. Nine of AFURI's restaurants in major areas in and around Tokyo, like Harajuku, Roppongi, and Yokohama, offer Vegan Vegetable Ramen (1,350 yen including tax) that is bright in color and entirely plant-based. It tastes as wonderful as it looks, topped with plenty of in-season vegetables. The noodles are unique, made with lotus root flour, which acts as a binder to create chewy, satisfying noodles. This is a nutritious and filling option. In addition to the exquisite, healthy ramen, each store location has a minimalistic design that adds a special atmosphere to your dining experience. This is a must-go restaurant for anyone who wants to try refreshing, light ramen. T's Tantan is a ramen restaurant known for its all-vegan, all-vegetarian menu. There are two Tokyo branches, located inside the ticket barriers of JR Tokyo Station and JR Ueno Station. The menu is extensive and contains three types of Taiwanese-style dandan noodles with golden (900 yen), white (850 yen), or black sesame (950 yen). In addition, there is shoyu (soy sauce) ramen (800 yen), tonkotsu ramen (800 yen), and hot and sour soup noodles (900 yen) on the menu (all prices include tax). Diners can also try seasonal ramen and side dishes such as soy meat karaage and gyoza. There are dessert options to choose from, too. While diners will not find meat or fish here, the ramen is very tasty and filling, attracting many customers regardless of their dietary habits. Stopping into T's is very convenient when you are traveling or sightseeing in the Tokyo or Ueno areas. The restaurants open at 7:00 for breakfast and stays open late. Please note you will likely have to pay a separate entrance fee to enter the station if you just want to eat at the restaurant and not ride a train. Directions: Take the long escalator going up from the main entrance area or follow signs for ecute from the JR train platforms. The restaurants introduced above are particularly ideal for socializing, as the menus include traditional animal and fish-based ramen, allowing everyone to try this popular dish and order what they like (with the exception of T's Tantan). With some preparation, it is easy to have this iconic Japanese meal and share in the love of ramen without eating meat or fish. *Restaurant information is current as of April 2019. Please be aware that prices and selection are subject to change. AIN SOPH. GINZA - Eat Jewel-Like Meals At A Vegan Friendly Restaurant! 2 Tokyo Burger Spots That Are Vegetarian And Vegan Friendly!